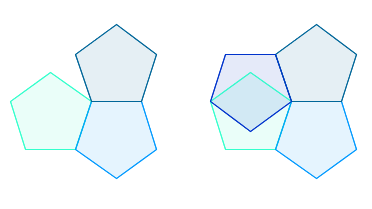 Out of all the regular polygons there are only three you can use to tile a wall with: the square, the equilateral triangle, and the regular hexagon. All the others just won't fit together. Trying to fit pentagons around a point. Suppose you try and make a tiling by fitting several copies, say of them, around a point so that they all meet at a corner (see the image above). Then the angles must add up to 360 degrees. If they add up to less there will be a gap, and if they add up to more then copies of the polygon will overlap. Since is a whole number (the number of copies of the polygon you are fitting together), this means that must also be a whole number. Therefore can only be equal to 4, 2, and 1, which means that can only be equal to 6, 4, and 3. Trying to fit a third polygon with two copies offset against each other. You can read more about tilings on Plus.